Seeing a praying mantis can be considered good luck or bad, depending on your culture. While walking around Hawkins Preserve in Cortez on a recent morning, I happened upon an insect that is letting itself be seen more this time of year. I managed to carefully scoop her (or him) up in my hand while she seemed to look at me with curiosity, and took a good look at her perfect little insect body. The praying mantis is thus named because of the interesting way it holds its front two legs, looking like they are in a praying position. The word ‘mantis’ actually comes from the Greek “mantikos,” meaning prophet. There are more than 2,000 species of praying mantids in the world, but only a certain portion of these are actually from the genus “mantis”; thus praying “mantid” is usually more correct. Their front legs are used to snag insect prey, and although the mantis may be sold in some garden stores as a beneficial insect, it doesn’t actually discriminate between eating harmful and eating beneficial insects. It will eat a beneficial honey bee just as likely as it will eat a damaging caterpillar. The praying mantis is also known for its two large compound eyes, adding to its “alien-like” appearance. Less well known, however, are the three simple eyes found between the compound eyes on its triangle-shaped head. The two large eyes enable the mantis to have stereoscopic vision, one of only two insects in the world that have this. The praying mantis is the only insect able to turn its head 180 degrees. Some, but not all, praying mantises have wings. Some praying mantises have one ear, located on their abdomen. It doesn’t hear most sounds very well with this ear, but it is actually able to hear high-pitched bat echolocation “peeps.” This enables the mantis to evade bats that are trying to get a midnight snack. Praying mantises mate in the late summer/early fall, and yes, the rumors are true – the female will sometimes either eat her mate after mating or will even bite his head off in the middle of the act (and the body will finish the job without the head). Although, this is much more common in captive mantises than in the wild. Some scientists estimate that wild mantises only cannibalize their mates 25 percent of the time. Incidentally, since starting to write this article about a week ago, I’ve seen five praying mantises in the wild; however, the fourth and fifth ones were a female who at first glance seemed to be holding her mate in her arms lovingly ... but in actuality, she was enjoying munching on his head! A female praying mantis found in the fall may be looking for a location to lay her egg cases called oothecae. She will lay perhaps hundreds of eggs in each ootheca, which initially looks rather soft and foamy, but eventually dries up, looking more like brown styrofoam. The young stay and grow in this case until spring or early summer when they all hatch out at once! The young nymphs that hatch look just like smaller versions of the adults. As the nymphs grow, they will periodically shed their exoskeleton, having a softer exoskeleton that forms underneath, and eventually hardens. They will do this six to nine times before becoming an adult size. Despite being predators in the insect world, praying mantises are also preyed upon. 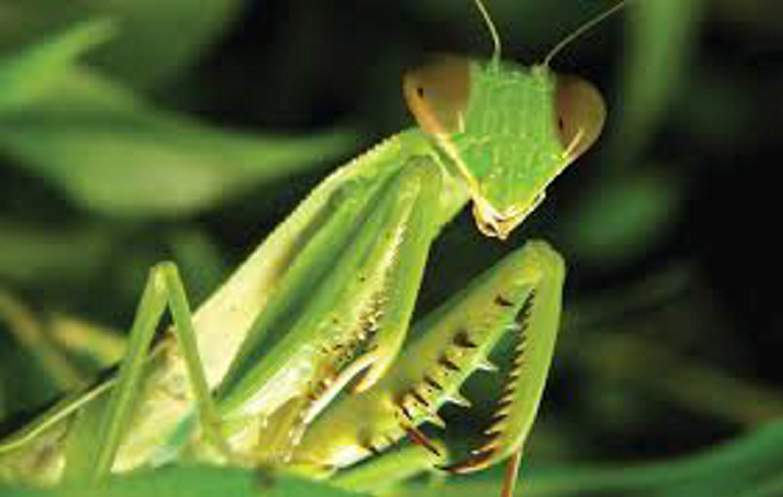 Spiders, ants, frogs, lizards and birds are all predators of the praying mantis. Their main defense is camouflage, and some blend in very well – mimicking flowers, leaves and sticks in their habitat. Seeing a praying mantis can be considered to be good luck or bad, depending on your culture. Because of the “praying” hands, some Christians say that the praying mantis represents spiritualism or piety, and if found in your home, may mean that angels are watching over you. Some Muslims say that the praying mantis is always facing toward Mecca. However, in Italy, some believe that if a praying mantis looks at you menacingly, it can make you sick, and in Japan, it may even be a foretelling of your death. Personally, I feel lucky any time I get to see one of these amazing insects, and can’t wait to see more.